Growing up in Norfolk, Virginia, Rosemary spent much of her childhood around the ocean. She was fascinated by the sea and had a strong desire to learn as much as she could about marine ecosystems. During her high school career, Rosemary participated in a summer travel program at the Forfar Field Station in the Bahamas on Andros Island. This experiential learning opportunity allowed Rosemary to be directly involved with field-studies that focused on scuba diving and exploration. Thanks to that unique experience, Rosemary was hooked on marine science. After Rosemary graduated high school, she earned her Associates Degree in General Studies of Science at a local community college, then transferred to Coastal Carolina University (CCU) to continue studying marine science. During her undergraduate career, she completed an independent research project in Discovery Bay, Jamaica and focused her studies on coral ecology. After she earned her degree at CCU, Rosemary was interested in becoming a NOAA Corps Officer. Since a few of Rosemary’s family members worked for NOAA, she was exposed to the Corps mission and impact from an early age. She applied and did not gain admittance; however, that did not set Rosemary back. Rosemary started working as a Physical Scientist intern at the Atlantic Hydrographic Branch in Norfolk, Virginia and sailed aboard NOAA Ship Thomas Jefferson for two field seasons. After this experience, she reapplied to the Corps, was accepted, and began her Basic Officer Training Class at Kings Point Merchant Marine Academy in February 2012. Officer training school was an intense program that emphasized leadership, teamwork, seamanship, and navigation. Once Rosemary graduated, her first sea assignment was on the hydrographic research vessel, NOAA Ship Rainier in Alaska. After this assignment, Rosemary’s land assignment was at the Florida Marine Sanctuary in Key West. She worked as a support diver to assess coral health and completed grounding assessments for three and half years before rotating to her current position as the Operations Officer aboard Okeanos Explorer. Now, Rosemary is involved with deep sea exploration and loves being on a ship that is dedicated to discovering more about the unknown parts of the ocean. Rosemary is enthusiastic about supporting NOAA’s mission of science, service, and stewardship. She believes that it is incredibly important to set goals, remain determined, and push yourself out of your comfort zone to experience success. 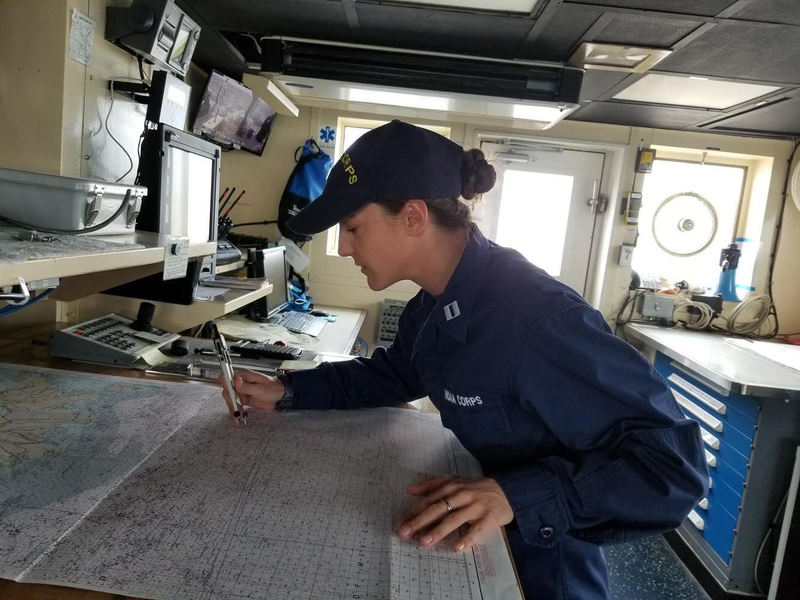 This entry was posted in 2018, Meredith Salmon, NOAA Teacher at Sea and tagged interview, NOAA Corps, NOAA SHIP OKEANOS EXPLORER. Bookmark the permalink.